It is said that the pen is mightier than the sword, though I much prefer my Swiss army knife. Still, I could not help but be fascinated by a class called “The Pen and the Sword” taught by an Aikido master. Truly, now was my chance to learn to kill a man with a ballpoint pen and land that job with the CIA. If he who lives by the sword, dies by the sword, then he who lives by the pen…? Writing is not for the weak. I must be strong. I must be prepared. I must be ready. I was ready to become both master of the pen and the sword. Anxiously I awaited the sensei’s arrival. The room was filled with gymnastic mats-also called tatami-and nervous energy. Here I would forge the weapon of my mind, the strength of my spirit, the tool of my will. A stout man came waddling into the room with a Grizzly Adams beard and blazing blue eyes, like a half-crazed Viking warrior who forgot where he put his bearskin. This could not be the teacher? Surely such a man was born to wield an ungainly battle-axe, not the eloquently crafted katana. Lost? Searching for a Wagner opera? A drumming circle? A mad rush of students surged to the back wall where a table sat loaded with clean, white paper and pencils. Quickly, I grabbed a pencil. “Only a minute to craft a poem of truth and beauty, and it has to be great!” I looked to the heavens for inspiration; I pleaded to my muse for guidance. I looked within myself, and found me. There’s a saying, “No matter where you go, there you are.” And there I was. There’s some that might say I’m bull-headed or have a blatant disregard for authority figures. Maybe, maybe not. But I was in the moment, and that rebel in me grabbed that pencil and wrote four quick lines that spilled out of me. Aikido (aikidō) is translated as the “way of harmonious spirit,” and emphasizes joining with an attack and redirecting the attacker’s energy. Hey, if you can’t beat ‘em, join ‘em. So this class was not to turn me into a lethal weapon, but it did make the art of poetry more accessible to me. The arts of war have strong traditions in many art forms, from poetry to calligraphy to flower arranging. Martial arts are more than what you do, or do to someone. Martial arts can help build confidence, fitness, discipline and awareness of one’s surroundings. It is something that you feel. Being what you are. Being in the moment and it ain’t always pretty. What is poetry? Is it more than just words? If it has no structure, is it poetry? If it doesn’t rhyme, is it poetry? If it’s in free form, or freestyle, is that a poem? Poetry, and discussions of it, have a long history, and poets and scholars will never agree on a definition. For me, poetry is a means of expressing an idea, emotion, feeling or memory in a concise way. It may be graceful, beautifully expressed, or even brutal-an elegant arc of a well-honed blade or a swift body blow to the breadbasket. For further reading check out, Sword and Brush by Dave Lowry: The way of the brush reflects the strategic principles of the sword; Lowry is master of both. Zen in the Art of Writing by Ray Bradbury: A celebration of the act of writing, by a master storyteller. I am unaware of his prowess in the deadly arts, but I don’t recommend meeting him in a dark alleyway. Kevin resides in Wellsboro, just a short hike from the Pennsylvania Grand Canyon. 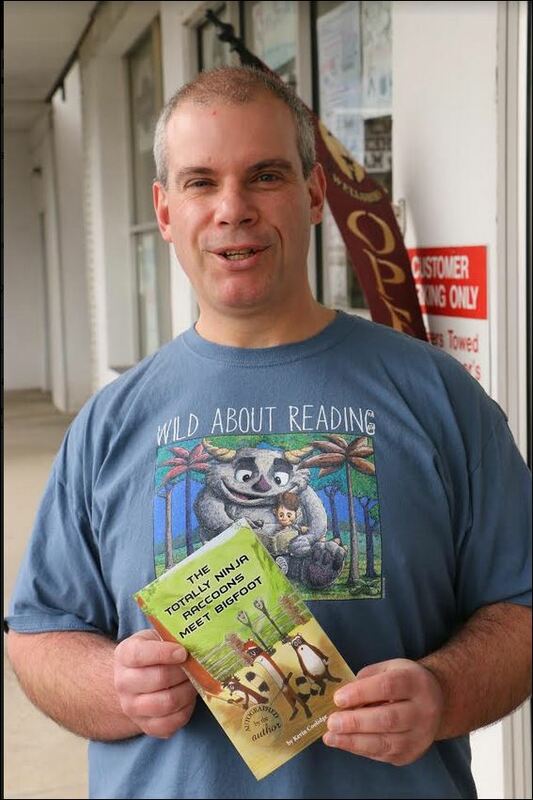 When he’s not writing, you can find him at From My Shelf Books & Gifts, an independent bookstore he runs with his lovely wife, several helpful employees, and two friendly bookstore cats, Huck & Finn. He’s recently become an honorary member of the Cat Board, and when he’s not scooping the litter box, taking out the garbage, or feeding Gypsy her tuna, he’s writing more stories about the Totally Ninja Raccoons.